At half past 7 o’clock in the morning, the Papal delegate for India, Monsignore Zaleski, who stays most of the year in Kandy, celebrated a mass in the small Catholic church attended by the whole Catholic community consisting mostly of mixed bloods of Europeans and Sinhalese. A large number of mostly dark-colored priests assisted the Montsignore while music and song in a not so harmonic way was contributed by the faithful. After the end of the mass I wanted to meet the delegate but unfortunately did find him there. We then went on a glorious morning drive on Lawrence Drive, a road that leads along a number of hills with a beautiful view of Kandy, the large pond, the Buddha temple, the whole panorama of the city and the mountain peaks in the distance. Everything was still covered in a blueish morning mist: the city houses at my feet, the Kandy valley and the distant mountain ranges. After I had browsed through the Reuter dispatches, eager for news about home, I took my leave from Sir Arthur und Lady Havelock in the governor’s pavilion. To remember the hours spent together with this lovely couple with a visible memento, we had a group photograph of us with the couple taken. The return drive to Colombo was glorious, part of which I did in the locomotive to have an unrestricted view. I couldn’t get enough of the wonderful scenery of the whole journey. The afternoon in Colombo was dedicated to shopping. We took the dinner, upon the invitation of our consular agent Schnell in his country house located outside the city. Mr and Mrs Schnell, the latter a young and pretty woman dressed in a patriotic black and yellow dress, gave me the honors and after the dinner, enchanted me with a performance of a devil dance which differed markedly from that seen in Kalawewa. It was, I might say, more civilized, less grotesque and notable especially by the dancer’s large wooden grimacing head masks out of which they very skilfully blew and spit fire. 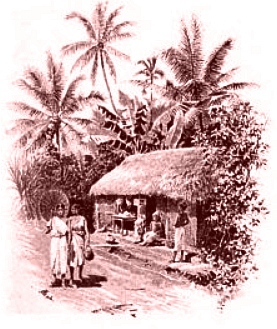 Music and song were of the same type as that of the jungle dance performed in Kalawewa. We were sitting under palm trees in a garden kiosk while the dancers moved on the open green. The devil dance was followed by an act of a conjurer who performed many tricks. The way in which he demonstrated the growth of a mango tree was interesting. The conjurer laid out a cloth on the ground, lifted it after a bit of hocus-pocus and, well, there suddenly was inch-high small green plant. The conjurer repeatedly covered the plant with the cloth and every time he lifted it, the plant had grown. It grew larger and larger and became a rich bush with long beautiful leaves, a growing little tree, a blooming tree and finally there stood a full grown blooming mango tree with ripe fruits in front of us on the green. He also showed his skills as a snake charmer. Out of two baskets, to the sound of a shalm, emerged two cobra snakes. They beamed and displayed their hood with clearly visible marks that looked like glasses and starred and moved hissing towards their master which looked dangerous but was in reality harmless as the teeth of the snakes had been removed. Still, Mrs Schnell uttered a light scream when one of the beasts turned and advanced on the green toward our feet. This garden party concluded our stay in Ceylon. We took leave of our very obliging hosts and returned hours later on board of SMS Elisabeth. 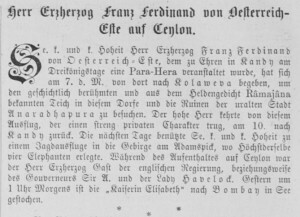 ANNO – on 13.01.1893 in Austria’s newspapers. In Paris, the Panama scandal is still raging in the streets, in the newspapers, in parliament as well as in the court room where the third day in court has started. A new 3,5 m long photographic panorama of Vienna’s city center has been completed and will soon be on public display. Out of Calcutta comes a telegram that informs about the planning of a governmental gala dinner for Franz Ferdinand, a reception of the Austro-Hungarian community, museum visits, parades, a native dance performance as well as a sightseeing trip to Darjeeling. The Wiener Salonblatt Nr. 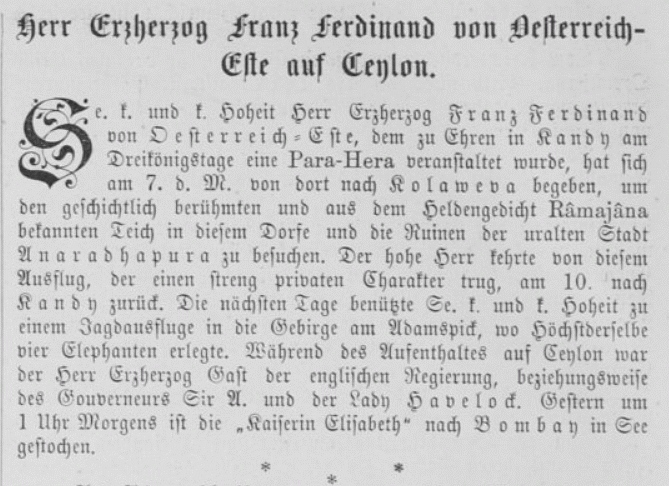 3 of 15 January already includes a notice about Franz Ferdinand’s stay in Ceylon and departure to Bombay. The k.u.k. Hof-Burgtheater is playing „Der Bibliothekar“, a comedy by Gustav von Moser while the k.u.k Hof-Operntheater performs Jules Massenet’s Werther. Dieser Beitrag wurde am 13. January 2018 von wordpressadmin in diary veröffentlicht. Schlagworte: Ceylon, Colombo, January, Kandy, shopping, sightseeing.